Whoops, sorry. We don’t know what you’re looking for, but we’re pretty sure this isn’t it. Try clicking the link below and starting over at our homepage. You can search there too. Get an inside look at the people, places and ideas that move us. In Western Australia, Meredith Roe is opening up the world of time travel to students across the State. But instead of having to clamber into a machine, fire it up and relocate instantly to the town or city where their teacher is located, students simply log on and get cracking. To equip today’s students for the workplace of 2030, a whole new curriculum is needed: one that centres on skills, not content. Australian schools hold sensitive data on teachers, students and their families. Following best practices can help them keep it safe. Games aren’t just ways to spark fun, they’re also powerful tools for teaching and learning! 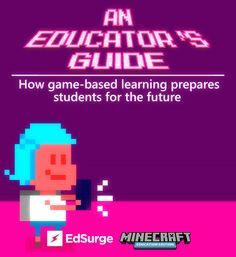 Check out this educator's guide packed with lesson plans, tutorials, and tips for teaching game-based learning.